Have a FREE Spin on the WMS Dragons Inferno Slot Game. WMS (Williams Interactive) Gaming is a game developer known to bring slots to punters that completely defy the normal style. Take the ripper Monopoly Super Money for instance. However, Dragons Inferno online slot machine bears no unique features other than the fact that it runs on G+ Deluxe engine. This engine makes it medium to high variance. True to its name, Dragons Inferno takes you back in time to an era of Dragons and lore. 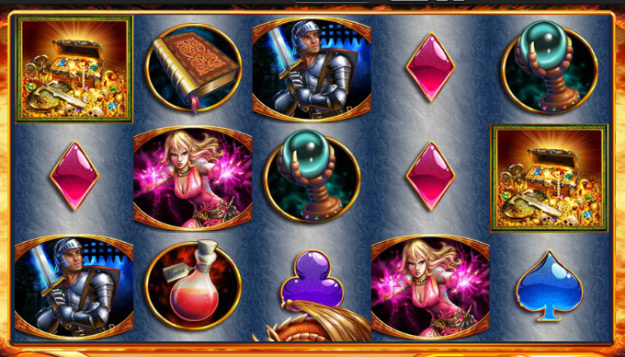 This being a role-playing themed slot, you are to avoid the Inferno in your hunt for riches. According to stories, dragons existed long ago and lived in caves surrounded by gold and other gems. You are to get past this beast without getting burnt by its blaze to get to the riches. You just have to brave past the dragon to win enormously. Symbols are in line with Dragons Inferno’s theme. They include female elves, treasure boxes, archers, potions, knights, spellbooks and crystal balls. Besides, there are playing card suits representing low rated symbols. This web pokie features 30 paylines on 5 reels. All paylines are fixed meaning you have to bet on all of them. This is a good thing as it ups your chances of hitting winning combos. To play, all you have to do is set your bet and hit spin. Bets range between 0.01 and 3.00 per line. This pegs minimum bet per spin at 0.30 and maximum bet per spin at 90 coins. Though this is a simple online pokie it can get you some great cash rewards; just fight Dragons and amass lots of gold. If you do not change your bet after every game, you can use the Auto-play feature to spin a set number of games in succession. You can also switch Dragons Inferno’s interface through C/QB button either to Classic or Quick Bet. Treasure Box icon is wild. It replaces other symbols, except scattered Dragon symbol, to complete winning combinations. You will also enjoy replicating wilds while playing this game. This is activated when a Dragon Treasure symbol forms part of a winning combo. The Dragon will emit a huge fireball which may land anywhere on your reels. Any symbol touched by the fireball instantly becomes wild. Though this Dragon only appears on reel 3, it occurs frequently. Free spins are the cream of the crop with this online slot. They are triggered when you land three or more scattered Dragon symbols anywhere in view. Three scatters will trigger 10 free spins, 4 scatters trigger 20 free games and 5 scatters trigger 40 free spins. The best part is that all wins during these bonus games are offered with 2x multiplier. If you trigger replicating wilds during free spins, your wins skyrocket. Better still, free wins can be re-triggered by landing three or more scattered Dragons in view. Dragons Inferno offers a cracker percent return to player payout. Highest paying symbol gives you 500 coins while second highest paying symbol gives you 200 coins. You can walk home with a Jackpot worth $1,500. This online slot, like other fantasy themed slots delivers big wins. You may stay for a long time without winning anything but once you do, you win huge amounts to allow you to go on a little shopping trip!